The most important aspect of a pocket book is that it should have a sharp and focused storyline that proves to be an interesting read. 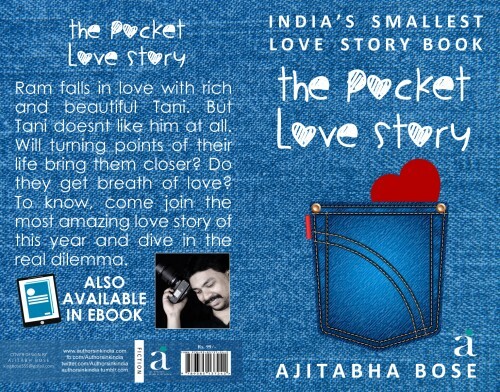 The Pocket Love Story By Ajitabha Bose is offers precisely that, making it a really good pocket book. Ajitabha Bose is a Mass Communication graduate with a knack for writing love stories. As I started reading his pocket book, I was impressed by the unwavering focus and the crisp story telling ability of the writer. The Pocket Love Story tells the tale of Ramchandra Chauhan, a boy from lower middle class family pursuing the course of Mass Communication in IMS Ghaziabad. Disappointed by the mediocre teaching offered by the college, Ramchandra is about to forgo his studies, when he sees the extremely beautiful Tani, who joins the college late and is instantly attracted towards her. Even though he tries hard, Ramchandra is unable to communicate with his dream girl. But when Tani fails to show up at the college for few days he inquires about her from her friends, which makes Tani approach him and scold him about his intentions on the day she joins back. Heartbroken by this episode, Ramcharan decides to leave college, but gets a surprising call from Tani, which gives new turn to his love story. To know what happens next and whether Ramchandra is able to express his love to Tani and whether or not she accepts him, you need to read the story. What impressed me most about The Pocket Love Story is that it tells the realistic tale of a common man in the simplest manner. The writer has used everyday life scenarios experienced by youngsters during their college life as well the emotions of novice lovers to build the momentum of the story. People can easily relate with every aspect of the story as it does not have fantasy elements or unrealistic characters. And of course the sweet twist with which the writer has concluded the tale enhances its appeal significantly. So overall, The Pocket Love Story is a good read, especially for people who love, love stories!